A group of citizens headed by resident Lynn Wheat have announced the formation of a grassroots citizen’s group aimed at uniting Elk Grove residents to oppose the city’s pending application before the Sacramento Local Agency Formation Commission (LAFCo) to ultimately expand the city boundaries by 8,000+/- acres. 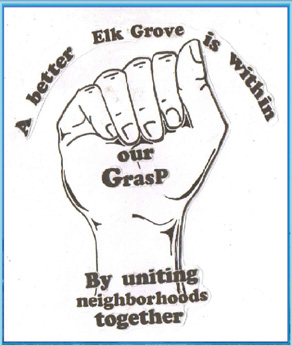 Under the banner of “GRASP—A better Elk Grove is within our Grasp - by uniting neighborhoods together.” The group notes that the City’s history of rezones, unrestrained urban sprawl and record breaking residential foreclosures shows the lack of commitment to the approved General Plan. Elk Grove GRASP is currently undertaking a petition drive to present to LAFCo showing that local residents are deeply concerned about: their continuing decline in home property values; lack of infill development; updated market data suggesting less demand for future growth; and the future costs to existing residents to provide water, sewer, fire, police, and other services to the new area. GRASP is opposed to the unnecessary city expansion to specifically accommodate more of the same type of development which has dominated the city during the past ten years—more rooftops and strip mall centers. Elk Grove GRASP welcomes interested residents to view their web site, Facebook page, or e-mail them for further information on how they can participate in becoming more involved in planning the future of Elk Grove. No Comment to " Elk Grove Citizen's Group Announce Petition Drive to Put Brakes on Growth "